Those of you who read my last email/newsletter will have spotted the deliberate mistake! Of course we are in 2018 and have been for more than a month! Time is moving too fast for me! 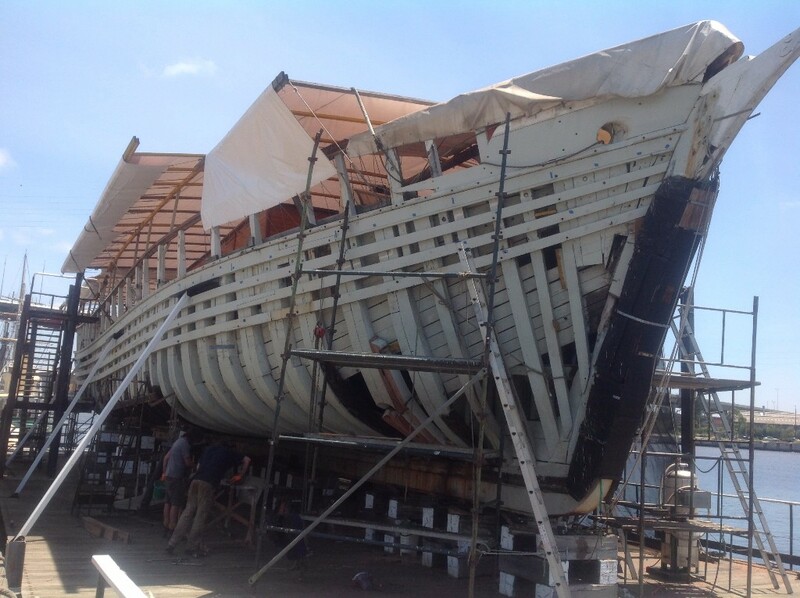 The shipwrights have returned to work this week and more progress is being made on replacing the frames. There are 50 frames to attend to with 15 frames completed before Xmas. Work has now commenced on frames 16-30. As mentioned in previous email/newsletter we are chasing funds to purchase 240 "below the waterline" planks. See the Alma Needs New Planks campaign. Keeping Alma's legacy afloat. 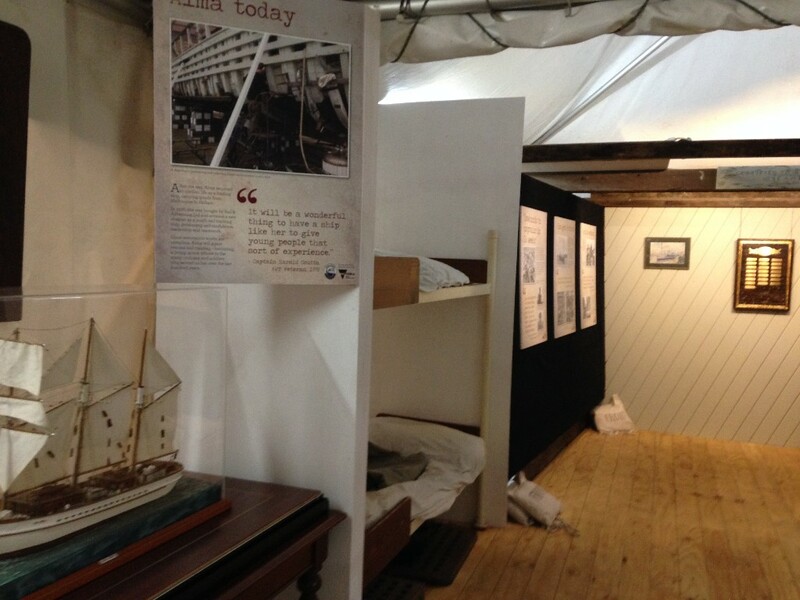 The "Soldiers at Sea" exhibition is now open, and we welcome all our supporters to come and have a look. We are running tours every Wednesday throughout February and March supported by the Library at the Dock. Book your spot today by reading the Meet the Maker Discovery Tour. For regular updates on Alma's restoration progress take a look at the Alma Chronicles. Immerse yourself in this discovery tour over summer and throughout the Sustainable Living Festival in at the Docklands Library at the Dock. 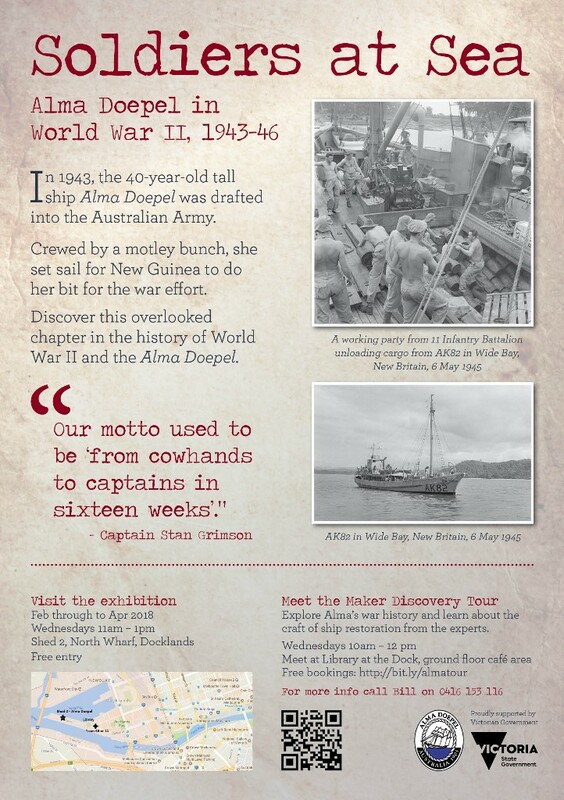 Explore Alma's war history "Soldiers at Sea" and learn about the craft of ship restoration from the experts. Be one of the first to see this new Alma Doepel exhibition. Meet at Library at the Dock, ground floor cafe area. 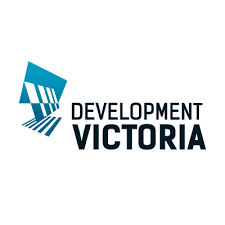 Free booking, and a donation on the day for morning tea. If you have been down to Shed 2 recently you will have seen the progress being made on Alma's hull. New planks have already been fitted to port and starboard sides above the waterline. Frames are steadily being repaired and replaced. See image below - everything white is new! Next job is to replace 240 planks below the waterline. We have found a timber supplier who can supply the required quality and size. Alma's new planks will now be milled by the end of March 2018. Please help Alma get her New Planks. 240 planks by $500 each. Buy one yourself or why not organise a group of 5 or 10 to join together. Plank Donors on acknowledged on Alma's Plank Honour Board. 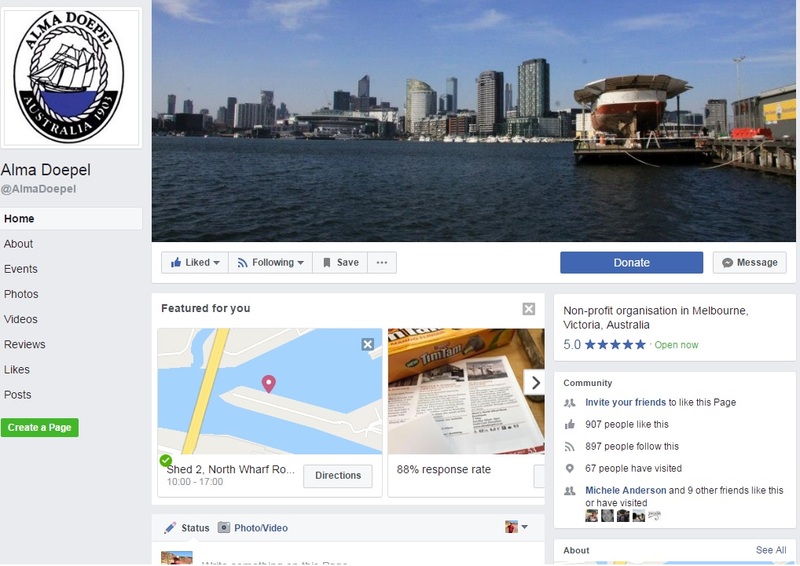 Follow us on Facebook Visit our Facebook page and like us to stay up to date. Also keep abreast of the restoration progress through Alma Chronicles. 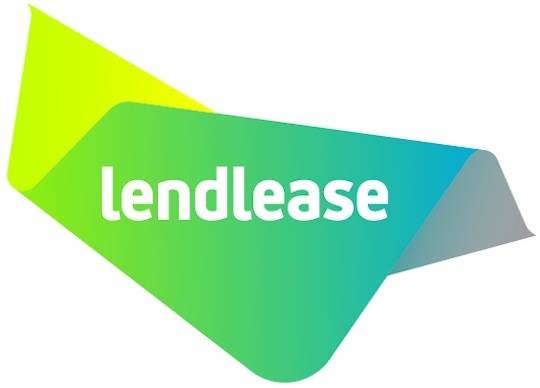 Founding Sponsors who's continued support have made this project possible. The Alma Doepel restoration team would also like to thank our Other Sponsors who's support enables us to continue the great work being done to restore the Alma Doepel. Word of mouth is a great way to help us get the word out about Alma, the restoration and what the ship will offer to young people once the restoration is complete. Invite your friends to our events, share our newsletters on social media, forward this email to someone you know, join us on Facebook (link at the bottom), talk about Alma when you're out and about, put some leaflets at your local events. The more people that know about us, the more people who think about us, the higher our profile and the more likely we will be able to complete the restoration on time and go sailing!